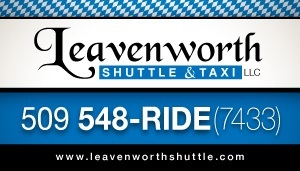 Providing friendly, punctual, and direct service to anyone visiting the Bavarian Village of Leavenworth. As well as around Washington. With our extensive list of vehicles and excellent drivers, transporting groups upwards of 200 people is a cinch. Corporate groups, wedding parties, or just a family on vacation, we do it all! If you’re taking the train, we are always available waiting at the Icicle station, even if it’s just a day trip. Going out to the bars? Be sure to give us a call even if its last call. With our 4x4 vehicles, getting you to those tricky trailheads is a breeze while taking the stress off your ride. We are now introducing Wine Tours to the valley, each of our specialty designed tours feature three of Wenatchee’s premier vineyards that you choose! Enjoy the sun and nature while relaxing in our shuttles with snacks and cold water in between estates. Each winery feature’s their own wine grown right on the property where you can tour the icy cellars, take a jaunt through the vineyard, or relax and sample many different varieties throughout the Wenatchee Valley.